June 10, 2017. Final Round of the 2017 Cliburn with conductor Leonard Slatkin and the Fort Worth Symphony Orchestra. One of the youngest pianists in the current Van Cliburn International Piano Competition – in progress in Fort Worth, Texas – is a Curtis Institute of Music student well-known to local audiences. Daniel Hsu, one of three Hsu siblings to come through Curtis in the last few years, has been at the school since he was 11. 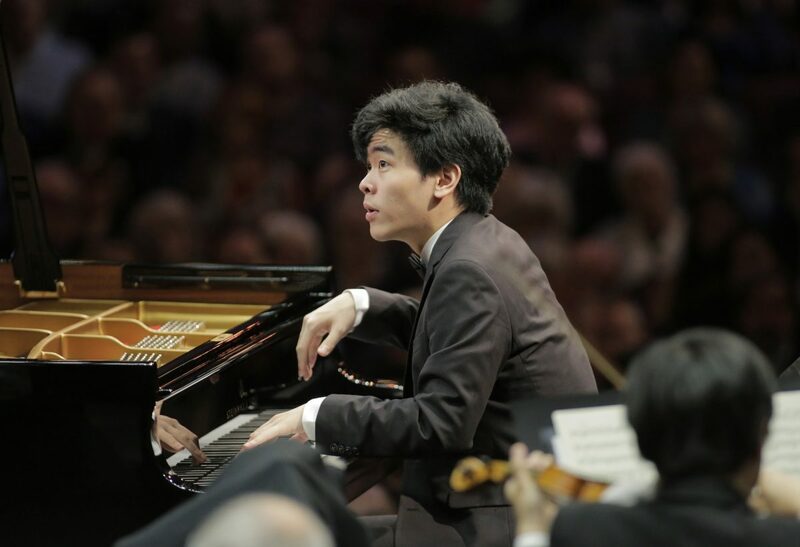 Now 19, he has made a strong showing at the august Van Cliburn. The competition, held every four years, started May 25 with 30 pianists chosen from 146 who auditioned. Thirty were whittled to 20, who each performed a 45-minute recital. Twenty became 12, among whom is Hsu (as well as Curtis graduate Yekwon Sunwoo). The results of the next round will be announced Monday. Six competitors will advance to the final round of concerto performances with the Fort Worth Symphony Orchestra led by Leonard Slatkin. Those performances will be broadcast to movie theaters across the United States on Saturday, with winners announced that night. We spoke with Hsu – a student of Eleanor Sokoloff’s at Curtis – this week, midcompetition, as he was preparing for the semifinal round of a 60-minute recital and a Mozart concerto with the Fort Worth orchestra conducted by Nicholas McGegan. Are you enjoying playing in this competition, or has it been just a lot of stress and pressure? I would be lying if I said there wasn’t any stress or pressure, but I grew up watching documentaries of the competition, and it never occurred to me that I would actually play in one, so getting to play here and being part of the whole experience is really cool. For example, in the first round, I played Don Juan by Liszt [Réminiscences de Don Juan], and one of my first memories of the Van Cliburn was hearing somebody play that piece … and 10 years later, I am playing it myself here. Are you able to forget the venue and context and simply focus on the music? Yes. I’ve been trying to treat it more as a performance than a competition. And I’m good with that for now. Do you think competitions are fair – in other words, do you think they find the best pianist, however you define that, or the pianist who is the best at playing in competitions? Well, I think the whole idea of a piano competition, a competition for music, is a bit silly. Music is so personal and unique to the performer. And then having some people you’ve never met in your life come out and critique you or judge you on it and having them say this person is better than the next, that whole idea is a bit absurd. That is my feeling about competitions in general, not a knock or negative of the Van Cliburn itself. As long as there are humans involved, you can’t really grade. It’s not like a math game where you win or you don’t win. As for whether they find the best pianist, I wouldn’t doubt the jury’s ability, or that they are very wise and would be able to spot the right things. But in the end, this is all personal. I’ve always had this impression that competitions favor great technique and players who don’t miss notes, rather than finding musicians who have something original to say or who have struck on some interpretive truth. What do you think? Not speaking about this competition in particular, but sometimes I find that to be true. It really depends on the competition and the jury. Again, it’s so hard to define. If you ask a jury member, ‘Did you pick this person because of technique?’ and they said, ‘No,’ maybe they found their interpretation appealing or suited to their own personal taste. That’s what makes this whole thing so weird – you can’t define any of this. You are among the younger competitors. Did you ask Mrs. Sokoloff’s advice on whether you should compete, and why did you feel this was a good thing to do now? I did ask her, and she was very supportive. I would say that whether or not I actually did the competition this year, I don’t think it made a big difference for me in terms of – I am young, and decided to do the competition because I got concerts playing the Franck Piano Quintet and a Tchaikovsky concerto, and they were specific piece requests and they fit well into the Cliburn. And so I just needed to piece together the solo recitals. Do you bring any kind of strategy into the competition? I don’t have much of a strategy. Everyone here has something different to say, and my strategy – and I’m not sure it’s a winning strategy, but it’s a strategy – is to go on stage and make music, be sincere, and play my heart out. And if I don’t advance, that’s OK. Performances can be viewed at www.cliburn.org. Tickets to the broadcast of the Saturday finals – being shown in area movie theaters, including the Riverview Plaza 17 and King of Prussia Stadium 16 – are available at www.FathomEvents.com.